A tantalizing Bourbon drink that is both refreshing and self-indulgent. This Basil and Fresh Peach Bourbon Cocktail begins with muddled fresh peaches and basil. It finishes with a stiff dose of bourbon. Muddle the peach and basil in a rocks glass. Add the fresh lemon juice and simple syrup. Add bourbon and stir together. Add crushed ice to fill the glass. Garnish with peach slices and basil leaves. Simple syrup is “simply” one cup of sugar (I use xylosweet for a substitute) dissolved into 1 cup boiling water and cooled. Store simple syrup in the refrigerator up to one month. 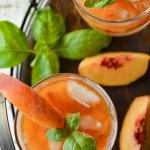 An over-ripe peach for muddling is the best because it is extra sweet with a rich peach flavor. An added bonus to this bourbon cocktail is the booze-soaked fruit. You don’t want to muddle to a mushy mess because the chunks of peaches at the bottom of the glass are as delightful as the drink itself.